Zucchini really does get a bad rap especially this time of year. If you are like me, your so done with the obligation of summers bounty. Everyone says “in a month you’ll miss that fresh basil, tomatoes, and zucchini”. You know what? I might, but right now I’m really sick of it. 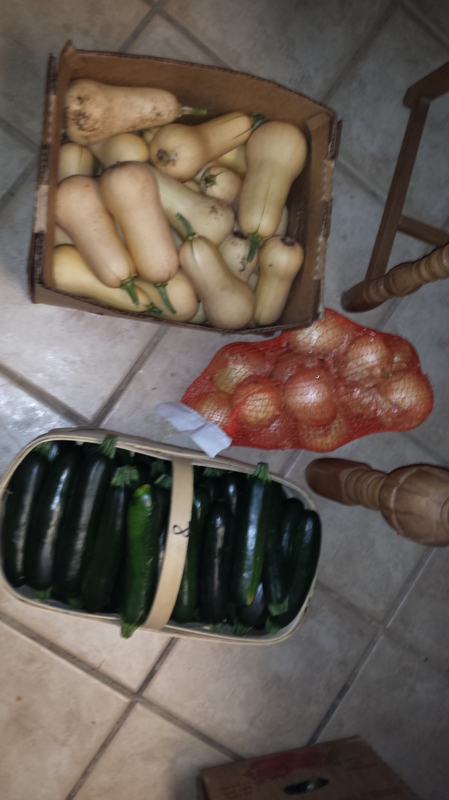 I did have a change of heart when I came into a bushel of zucchini for a price I couldn’t resist. $8 for 56 pounds of delightful squash. My first thought was someone can actually get money for zucchini? I kept thinking of all the zucchini bread I could make. I have a strange relationship with Zucchini bread here is the recipe. It came on the back of the C& H sugar box and I had a torn off box copy for years. As a child growing up on a farm and being a suburban farm girl from California, I had no idea that zucchini could be a small affair. Every Zucchini we ate was the size of my arm. On the farm you did three things with Zucchini. First you cut it in half and fed it to the chickens, second you cut it in half and stuffed it with ground taco meat and covered it with cheddar cheese, and finally my favorite, my mom made “Zucchini cupcakes”. I will admit I was a gullible child (I believed in Santa until I was 11 but that’s another story) As a young child we were taught that these spicy sweet cupcakes we’re the biggest naughtiest treat we were allowed. The irony my mom followed the C&H recipe except for the sugar, because sugar was expensive and honey was free. My dad and grandfather kept bees and we had all the honey we wanted. So honey was always a substitute in every recipe for sugar. It took me until 2nd grade to realize that there were different kinds of cupcakes out there that could be made at home. 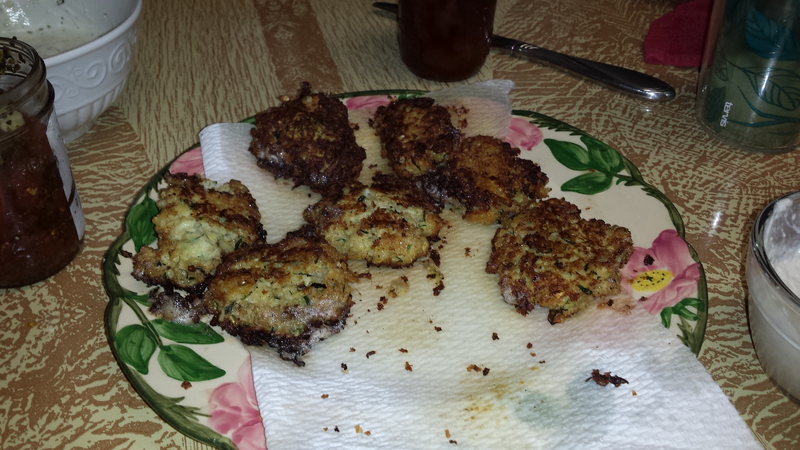 Of course mom came to the rescue with a zucchini fritter recipe that she had fallen in love with. Okay, I like fritters. So I found this fun recipe and tried it for… Breakfast. I tend to like a savory oddity with weekend breakfast. It was actually really good topped with my homemade bruschetta. I also served it with a horseradish cream sauce that Mike wasn’t too sure of, But I had a bushel to deal with it was time to be creative. As an adult I still have a strange lov e of zucchini bread. I brought home my beautiful bushel of vibrant green squash and made 4 loaves. I gave two to neighbors, and kept two for us. I sent pieces in mike’s lunch smeared in butter. After about three days they started coming back with his lunch oh no, zucchini overload already. Ball big book of preserving to the rescue! 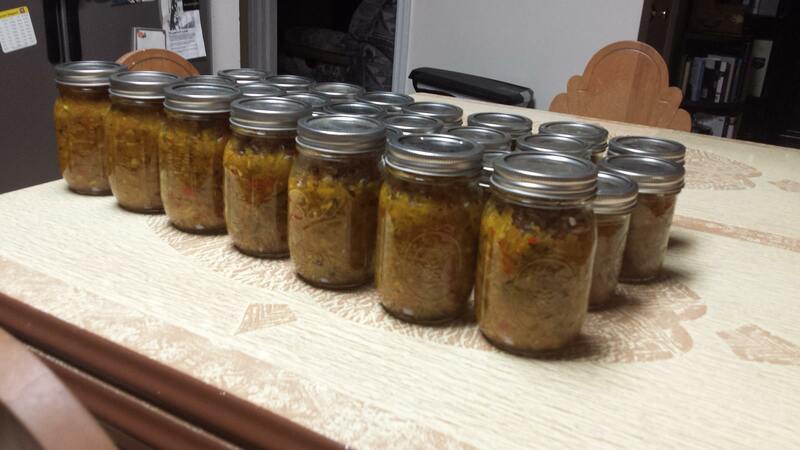 I flipped through my canning bible I came upon this recipe “Zesty Zucchini Relish” . 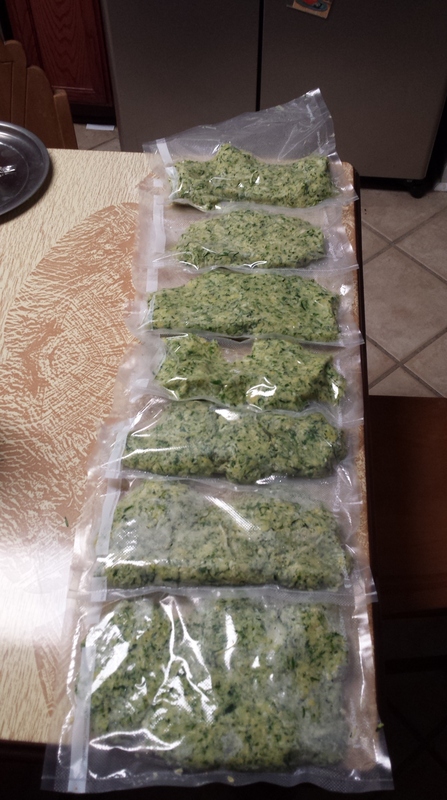 It used 12 cups of finely diced zucchini, and 4 cups of onions,(which I had also bought a bushel of) and bell peppers (I had bought a half bushel of these too) this was perfect, any recipe that would use up this much available produce is always a keeper. Well as things tend to go in my household the Zucchini kept losing out to other produce that was expiring faster cucumbers, tomatoes, peaches.This rainy weekend was finally my chance, I’d wrap this project up in one day no problem. I started to follow the recipe which of course I hadn’t actually read all the way through. Okay step 1 lets dice up everything, time to go in the pot, step two“let sit for 12 hours” crap. OK guess this isn’t getting done in one day I thought to myself. The fumes from the chopping had already driven Mike from the kitchen. My next thought was that’s okay though because I was also going to freeze the rest of my zucchini, so I could make my beloved bread all winter long. Well time to dig out the food processor that only gets used for making pesto I think it had a grater on it. Stupid Zucchin i kept getting wedged between the lid and the grater so every two zucchini I found myself taking it apart and emptying the bowl. Still faster than using my little metal cheese grater. Wow this made lots of zucchini. 48cups, that’s a lot of bread. Next the blanching, oh crap you know how hard it is to fish out those little strings of zucchini with a slotted spoon. Small note when blanching a vegetable this thin 2 minutes top or you will have mush. I ended up dumping it all into a colander and then dumping it into an ice bath from there. The directions then say to pat dry. Um no, not even going to get out the water, and you don’t want frosted ice crystals. I ended up using a flourcloth towel and squeezing the water out that way into a bowl. Nice side product I ended up with 14 beautiful cups of green zucchini juice that I froze in 2 cup -portions to be used as the basis for vegetable stock in soups. When it was all said and done and the water was out of my zucchini I was left with about 15 cups. I did 2 cup portions in my food saver, and prayed I had enough on the roll, because I would never actually think of purchasing freezer bags ahead of time. Next morning Mike’s switching the laundry (who am I kidding next afternoon we’re never out of bed before 11am on a Sunday) He asks what was that smell . I open a pot and he flees the laundry room mumbling that he doesn’t eat relish and who would make such a putrid smelling dish. I smiled you think that’s bad dude you haven’t smelled anything yet. It was about to get better. I put the pot on the stove and added the turmeric, nutmeg, horseradish (12 tablespoons, Mike made the comment no one should have to eat anything with that much horseradish) the vinegar and sugar and left it to boil. He came in later from outside and made the comment about it smelling like a German farm house. (He’s forbidden me to make any fermented items especially sauerkraut he draws the line at rotting vegetables!) I’m a good German girl so I took it as a compliment and promised to burn lots of Yankee candles to diffuse the rich yummy aroma of savory relish. 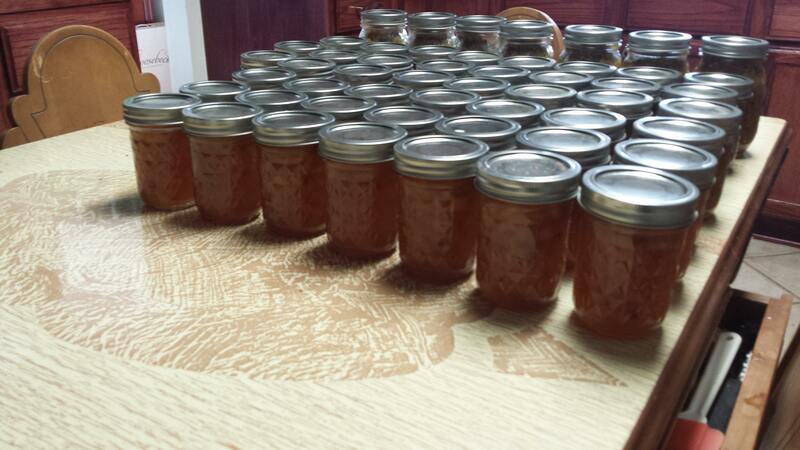 In the meantime I thought it would be good to give my lavender peach jam a second try. The first batch came out as “topping” also known as jam that doesn’t set up. This time the jam came out perfect (after I boiled the heck out of it) The trick is to put the certo in and bring it back to a hard rolling boil and then start the one minute timer. Not before. Here’s that recipe if you’re interested. At the end of the day I had 24 half pints of relish, 8 pints of relish, and 21 half pints of jam. 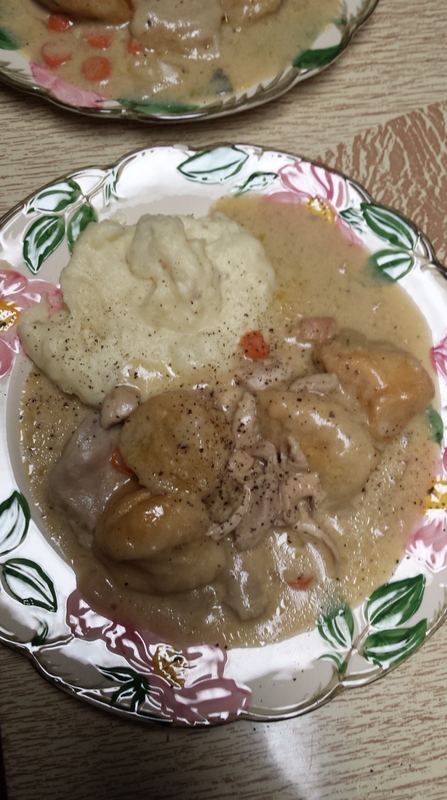 Dinner was made chicken and dumplings thank you Mercedes Navy Wife Cook, more of my fingerling potatoes that I also have a bushel of. A yummy enselada caprese with homemade mozzarella and basil and tomatoes out of the garden. A Rosemont Shira z to round it off (note: when drinking an inexpensive red, cooling it will help reduce some of the sharper notes that one might find offensive). I already discovered the relish makes a nice dip, it will go perfect on bratwurst. I’d love to hear how you deal with your bountiful zucchini harvest.